Gordon Beeferman’s IMAGINARY BAND: a real 7-piece group with a rotating roster of some of NYC’s most remarkably creative musicians. Performing Gordon’s new compositions — gnarly, lyrical, whimsical, free-form — an idiosyncratic mix of new-music, jazz, and free improv. 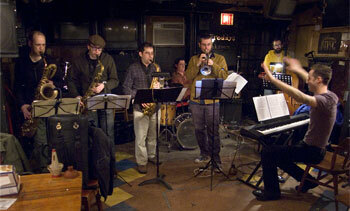 Image, left to right: Josh Sinton, Matt Bauder, Evan Rapport, Michael Evans, Nate Wooley, Brad Kemp, Gordon Beeferman, performing at Freddy’s Backroom, Brooklyn, February 24, 2009.